People wondering about flu shots are getting some very specific guidance this week: Pediatricians say kids should get a shot if possible and not the FluMist nasal spray, and a major hospital group says it’s choosing egg-free vaccines for patients and staff. The American Academy of Pediatrics recommends shots for children of all ages, even though the needle-free vaccine will be available, saying the shots work better. FluMist is an alternative for children who completely refuse to get a shot, the AAP says in its latest guidelines. And the University of Pittsburgh Medical Center is taking that a step further, saying it will only be buying the two egg-free vaccines on the market: Flucelvax and FluBlok. That’s because there is some evidence these two formulations may work better than the older vaccines grown in eggs, said Dr. Richard Zimmerman, who advises the UPMC Influenza Committee. “The egg-free vaccines appear to have perhaps a 10 percent higher effectiveness over the traditional egg-based vaccines,” Zimmerman said in an interview. Both decisions go further than the recommendations from the Centers for Disease Control and Prevention, which says everyone over the age of six months should get a flu vaccine. “CDC does not recommend one flu vaccine over another. The most important thing is for all people 6 months and older to get a flu vaccine every year,” the CDC says. But it is also known that flu vaccines in general do not protect people as well as most other vaccines do. Americans have about a dozen different influenza vaccines to choose from, produced by seven different manufacturers. There’s a high-dose vaccine for elderly people and formulations approved for children and babies. Most people don’t even know which vaccine they are getting, as clinics, pharmacies and doctors usually make their own arrangements with suppliers. 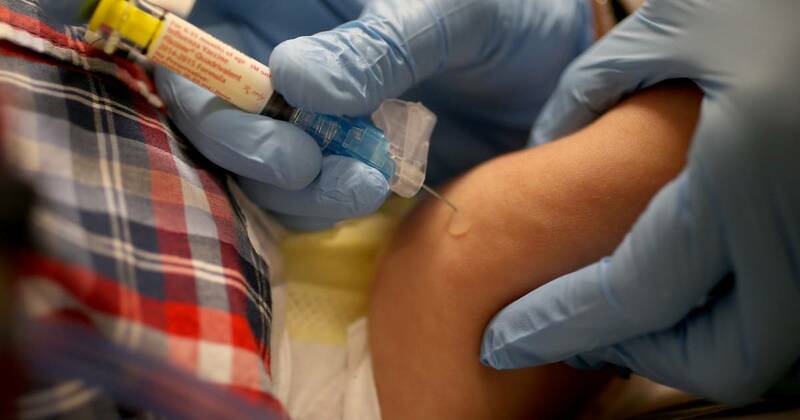 UPMC is taking an unusual step in saying which vaccines it is providing. “UPMC will be offering Flublok or Flucelvax to all patients age 4 or older throughout the 2018-2019 flu season, and all of its 85,000 employees,” the hospital group said in a statement. “Neither vaccine contains egg proteins, antibiotics, preservatives or live virus, and they come in single-dose, prefilled syringes that do not contain natural rubber latex. They both immunize against the four strains of flu that world health officials forecast as most likely to circulate,” it added. There are several problems with using eggs to make vaccines, one of which is a mutation the current H3N2 flu virus gets when it is grown in eggs. It makes the virus harder for the human immune system to recognize and fight it. The result is a flu vaccine that doesn’t offer much protection. FluBlok uses genetic material from the most common circulating flu viruses and combines it with an insect virus called a baculovirus grown in caterpillar cells. Flucelvax is grown in canine kidney cells. Manufacturers hoped these processes would make them both quicker to manufacture and more effective. Flu is a major killer. The CDC estimates that between 140,000 and 700,000 people get sick enough from flu every year in the U.S. to need hospital care, and the annual flu epidemic kills anywhere from 12,000 to 56,000 people a year, depending on how bad the flu season is. The CDC says this past flu season was a severe one. Flu activity stayed high in all 50 states, or nearly all, for weeks on end — an unusual pattern. A record number of children died during the 2017-2018 flu season. New flu drug on the way? The CDC says vaccines are the best way to prevent flu but there are several drugs on the market that can treat it. There’s a chance a new one may hit the market before the end of the coming flu season. The Food and Drug Administration has agreed to fast-track consideration of baloxavir, which takes a new approach to treating flu. It also appears to helps control flu symptoms after one dose. Tamiflu is recommended for children and people who have a high risk of complications from flu, but patients must take multiple doses over several days. Relenza is less commonly used, but it and peramivir are more useful for hospitalized patients who may be unable to take pills. Universal credit: Should the benefit be paid monthly or weekly? October 18, 2018 Comments Off on Universal credit: Should the benefit be paid monthly or weekly?